This post finds us at the cutting edge of physics, numerical general relativity. Because we haven't perfected mind-to-mind transmission of information, we won't actually be able to cover in any real detail how this all works. If you are interested, you can check out Wikipedia or Living Reviews. Once you've done that, and maybe taken a few graduate courses too, you can go ahead and read this article. Reissner-Nordstrom: static, spherically symmetric, charged. Kerr, Newman: rotating, spherically symmetric, charged. In order to study more realistic situations, like a pair of black holes orbiting each other, you need to solve Einstein's equations numerically. Traditionally, this has been done either from scratch by each individual researcher, or you may inherit some previous work from another researcher. But, now there is a project everyone can use, the Einstein Toolkit. The project started out as Cactus Code. 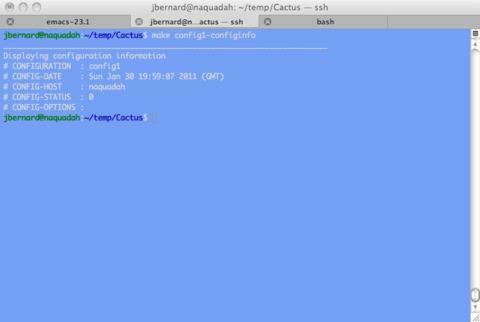 Cactus Code is a framework consisting of a central core (called the flesh) and a number of plugins (called thorns). Cactus Code provides a generic framework for scientific computing in any number of fields. The Einstein Toolkit is a fork of Cactus Code with only the thorns you need for numerical relativity. General relativity is a theory of gravitation, proposed by Einstein, where time is to be considered simply another dimension, like the three spatial ones. So the three space and one time dimensions together give you space-time. Numerical relativity (at least in one of the more common techniques) re-introduces the break between space and time. The basic idea is that you describe space at one instance in time, and then describe with equations how that space changes moving from one time to another. This technique was introduced by Arnowitt, Deser and Misner, and is called the ADM formalism. The code in the Einstein Toolkit uses a variation on this technique. You can do it this way because the file einsteintoolkit.th actually is downloaded to the current directory by the GetComponents script. This is pretty heavy-duty number crunching, so you likely will need to make sure you have several other packages installed on your system. You will need a C compiler, a C++ compiler and a FORTRAN compiler. You'll probably want to install MPI as well. File input and output is available in ASCII, but you may want to consider HDF5 for more structured data. Some thorns also may need some specialized libraries, such as LAPACK. This depends on which thorns you actually are using. The way Einstein Toolkit is set up, you create and use a configuration for a particular executable. This way, you can have multiple configurations, which use different thorn combinations, all from the same core source code. To create a new configuration, it is as simple as typing make configname, where configname is the name you give to the configuration. For the rest of this article, let's play with a configuration called config1. So you would type make config1, and get a new subdirectory called config1 containing all the required files. Don't forget that this needs to be done from within the Cactus directory that was created by the GetComponents script. Once this initialization is done, you can execute several different commands against this configuration. An example would be make config1-configinfo, which prints out the configuration options for this particular configuration (Figure 1). If you ever want to start over, you can try make config1-clean or make config1-realclean. If you are done with this particular configuration, you can get rid of it completely with make config1-delete. Now that everything is configured exactly the way you want it, you should go ahead and build it. This is done simply with the command make config1. Now, go off and have a cup of your favourite beverage while your machine is brought to its knees with the compile. This is a fairly complex piece of software, so don't be too disappointed if it doesn't compile cleanly on the first attempt. Just go over the error messages carefully, and make whatever changes are necessary. The most likely causes are either that you don't have a needed library installed or the make system can't find it. Keep iterating through the build step until you get a fully compiled executable. It should be located in the subdirectory exe. In this case, you will end up with an executable called cactus_config1. You can run some basic tests on this executable with the command make config1-testsuite. It will ask you some questions as to what you want to test, but you should be okay if you accept the defaults most of the time. When you get to the end, you can ask the system to run all of the tests, run them interactively or choose a particular test to run. Remember, if you are using MPICH, you need to have mpd running on the relevant hosts so the test suite will run correctly. This by no means guarantees the correctness of the code. It's just the first step in the process. As in any scientific programming, you should make sure the results you're getting are at least plausible. where X is the number of CPUs to use, and parfile.par is the parameter file to use. As it stands, the Einstein Toolkit provides a very powerful set of tools for doing numerical relativity. But, this is only the beginning. The true power is in its extensibility. It is distributed under the GPL, so you are free to download it and alter it as you see fit. You just have to be willing to share those changes. But, the entire design of the toolkit is based around the idea that you should be able to alter the system easily. It's as simple as writing and including a new thorn. Because you have all the source code for the included thorns, you have some very good examples to look at and learn from. And, because thorns are ideally independent from each other, you should be able to drop in your new thorn easily. The list of thorns to be compiled and linked into the flesh is controlled through the file configs/config1/ThornList. In case you decide to write your own thorn, I'll cover a bit of the concepts here. A thorn should, ideally, be completely unlinked from any other thorn. Any communication should happen through the flesh. This means that data should be translated into one of the standard formats and handed off to the flesh. The thorns are responsible for everything from IO to data management to the actual number crunching. If you are working on some new algorithm or solution technique, this is where you want to be. The last step is getting pretty graphics. You likely will want to share your results with others, and that seems to be easiest through pictures. You will want to use other tools, like gnuplot, to generate plots or even movies of the results from your calculations. Several tutorials exist for what you can do with tools like gnuplot. I hope this has given you enough to get started with a very powerful tool for numerical relativity. And, as always, if there is a subject you'd like to see, please let me know. Until then, keep exploring.